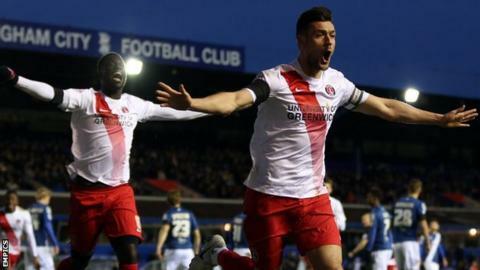 Johnnie Jackson scored the only goal of the game as Charlton Athletic moved out of the Championship relegation zone with victory at Birmingham City. The Blues were dealt a blow before kick-off, with Clayton Donaldson ruled out with a groin injury and expected to be out of action for six weeks. Jackson broke the deadlock for the visitors in the second half when he headed in Tareiq Holmes Dennis' cross. The Blues, who were 5-2 winners at Fulham in their last game, are now without a home win in three matches while Charlton have now claimed back-to-back wins after beating Sheffield Wednesday before the international break. Jacques Maghoma had an early chance for the hosts but his powerful drive was easily saved by Stephen Henderson. Ademola Lookman, who was making his first start for the Addicks, then should have done better from close range when he struggled to control the ball before Holmes-Dennis forced Tomasz Kuszczak to parry his attempt at goal. Charlton's deep defensive line left the hosts frustrated as Jon Toral saw a shot scrambled away. Demarai Gray forced Henderson into a fine save after the break before Stephen Gleeson fired wide. But, with just over an hour on the clock, Jackson nodded into the net after meeting Holmes-Dennis' cross following Lookman's pin-point pass. And Charlton went close to doubling their lead when Kuszczak's reflex save denied Ricardo Vaz Te from adding a second. Donaldson picked up his injury while on international duty with Jamaica. "It is hard because you judge a season on points. At home you want to win but teams are showing us a lot of respect at St. Andrew's. We have to make sure that it doesn't become a complex. At times we need to play with more quality. "I couldn't say we didn't create enough chances. We had 22 shots whereas they had just eight but scored the only goal. Charlton's was a poor goal to concede. I thought it was very sloppy. We switched off for a free-kick and it was their only real chance on goal in the whole game. "We then had a mountain to climb. For five or 10 minutes we looked shell-shocked to be one down before we got it back. We ended up with three l9-year-old players on the pitch trying to chase the game but we just couldn't find the finishing touch. "At the moment at home things are not going our way. I thought we should have had a clear penalty when (Nicolai) Brock-Madsen had his arm tugged but we not getting the rub of the green." "Whether it is called interim or permanent will not effect me. The board make the decisions. We were aware that Birmingham struggle at home when they try to be dominant. Without playing defensively we tried to put together a good organisation. "Our win over Sheffield Wednesday a fortnight ago gave us confidence to withstand some difficult moments. Both teams had their chances and we managed to take one when our skipper Johnnie Jackson scored. "We know the qualities of our captain. He is a real leader and we get along really well. It was only his fifth game of the season and it was his third goal which makes him our leading goalscorer. "The back-to-back wins are vital after that disastrous performance at Middlesbrough. No one wanted to be part of the dressing room. They were so down at that moment but after turning the corner against Sheffield Wednesday two weeks ago it gave us a huge boost not to be in the same situation again." Match ends, Birmingham City 0, Charlton Athletic 1. Second Half ends, Birmingham City 0, Charlton Athletic 1. Attempt missed. Viv Solomon-Otabor (Birmingham City) left footed shot from the centre of the box is high and wide to the right. Attempt blocked. Jon-Miquel Toral (Birmingham City) left footed shot from the centre of the box is blocked. Substitution, Charlton Athletic. Karlan Ahearne-Grant replaces Simon Makienok. Attempt missed. Reece Brown (Birmingham City) right footed shot from outside the box is close, but misses to the right. Assisted by Viv Solomon-Otabor. Attempt saved. Stephen Gleeson (Birmingham City) right footed shot from outside the box is saved in the centre of the goal. Assisted by Jon-Miquel Toral. Substitution, Charlton Athletic. Reza Ghoochannejhad replaces Johann Berg Gudmundsson. Offside, Charlton Athletic. Johann Berg Gudmundsson tries a through ball, but Ricardo Vaz Te is caught offside. Corner, Birmingham City. Conceded by Tareiq Holmes-Dennis. Attempt blocked. Jonathan Grounds (Birmingham City) header from the left side of the six yard box is blocked. Assisted by Jon-Miquel Toral with a cross. Corner, Charlton Athletic. Conceded by Michael Morrison. Attempt missed. Reece Brown (Birmingham City) right footed shot from outside the box is high and wide to the right following a set piece situation. Reece Brown (Birmingham City) wins a free kick in the defensive half. Viv Solomon-Otabor (Birmingham City) wins a free kick in the defensive half. Attempt saved. Johann Berg Gudmundsson (Charlton Athletic) left footed shot from outside the box is saved in the bottom right corner. Assisted by Patrick Bauer. Offside, Birmingham City. Michael Morrison tries a through ball, but Jon-Miquel Toral is caught offside. Attempt blocked. Jon-Miquel Toral (Birmingham City) left footed shot from the centre of the box is blocked. Assisted by Nicolai Brock-Madsen with a headed pass. Foul by Alou Diarra (Charlton Athletic). Attempt missed. Jon-Miquel Toral (Birmingham City) header from the centre of the box misses to the right. Assisted by Viv Solomon-Otabor with a cross. Delay in match Viv Solomon-Otabor (Birmingham City) because of an injury. Attempt missed. Demarai Gray (Birmingham City) right footed shot from outside the box misses to the left. Assisted by Viv Solomon-Otabor. Substitution, Birmingham City. Reece Brown replaces Jacques Maghoma. Attempt missed. Simon Makienok (Charlton Athletic) header from the centre of the box is just a bit too high. Assisted by Johann Berg Gudmundsson with a cross. Offside, Birmingham City. Paul Caddis tries a through ball, but Nicolai Brock-Madsen is caught offside. Corner, Birmingham City. Conceded by Jordan Cousins. Substitution, Charlton Athletic. Ricardo Vaz Te replaces Ademola Lookman because of an injury. Goal! Birmingham City 0, Charlton Athletic 1. Johnnie Jackson (Charlton Athletic) header from the centre of the box to the bottom right corner. Assisted by Tareiq Holmes-Dennis with a cross following a set piece situation.